When your doctor recommends physical therapy, make the short drive for the smart choice. 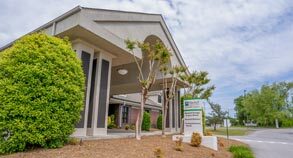 TherapyPlus offers two convenient locations for comprehensive physical therapy and rehabilitative services — one at the Marshall North campus and one just south of the Marshall South campus. At both facilities we pair the latest technological advances in equipment with one-on-one personal attention. Aquatic therapy services at North are provided at our Olympic-size pool in the combined therapy and fitness/wellness facility, with pool-based therapy at South offered at our separate fitness/wellness center on the main South campus. When you’re getting over an illness or injury, the faster the better. And the more resources and experience you have at your disposal, the better your chances for a strong, fast recovery. At TherapyPlus we field a team of 27 highly skilled professionals, with more than 300 years of combined experience. With two convenient locations and quick access to excellent medical care, it all adds up to a winning formula for rehab and therapy.